Generally, when you build your lair in Minecraft, you need a door. There are two ways you can go about getting one: either craft one out of wood or metal, or engineer a clever gate using redstone machinery. These videos are about the latter, but they're fun even if you don't care about the doors themselves. Rather, it's how these doors are realized that's entertaining—the one in the gif up top is from a video called 20 More Doors In 100 Seconds, which was uploaded last weekend. The builder, Mumbo Jumbo, set up his gates in a straight line, more or less, to create a smooth ride. And then there's the music, which just makes the clip all the more charming. 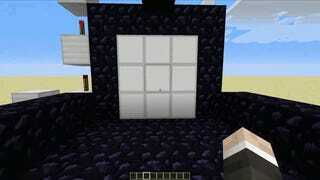 MrMumbo wasn't the first one to think of this concept: here's PandoraMinecraft's 30 Doors in 120 Seconds from 2012. Basically it's the exact same premise, but from two years earlier, so the tech isn't as advanced (or rather, as up to date) in this one. It's more of a straight-up showcase than MrMumbo's stuff, which has stronger comedic timing, but it's entertaining in its own right. My interactions with redstone only go as far as mining it and shuffling it around in storage chests, so I'm more of a straight up wooden door kind of guy, but these kinds of redstone doors are great if you're looking to make something unique, or you want to show off your engineering skills on a multiplayer server.